Since the first edition of The World Trading System was published in 1989, the Uruguay Round of trade negotiations has been completed, and most governments have ratified and are in the process of implementing the General Agreement on Tariffs and Trade (GATT). In the Uruguay Round, more than 120 nations negotiated for over eight years, to produce a document of some 26,000 pages. 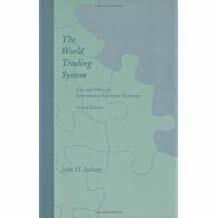 This new edition of The World Trading System takes account of these and other developments. Like the first edition, however, its treatment of topical issues is grounded in the fundamental legal, constitutional, institutional, and political realities that mold trade policy. Thus the book continues to serve as an introduction to the study of trade law and policy. Two basic premises of The World Trading System are that economic concerns are central to foreign affairs, and that national economies are growing more interdependent. The author presents the economic principles of international trade policy and then examines how they operate under real- world constraints. In particular, he examines the extremely elaborate system of rules that governs international economic relations. Until now, the bulk of international trade policy has addressed trade in goods; issues inadequately addressed by policy include trade in services, intellectual property rights, certain investment measures, and agriculture. The author highlights the tension between legal rules, designed to create predictability and stability, and the governments need to make exceptions to solve short-term problems. He also looks at weaknesses of international trade policy, especially as it applies to developing countries and economies in transition. He concludes with a look at issues that will shape international trade policy well into the twenty-first century.